It is important to have at least one person to look up to in life; you can use this person as a motivation and guide for how you would like to live your life and inspire you to take on qualities which you would like to possess. 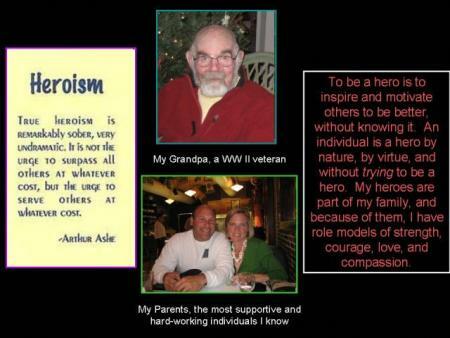 I have several heroes in my life, but the most influential ones are my parents and my grandfather. There are other individuals, such as accomplished athletes, chefs, and actors, who I would consider heroes in my life, but the people in my family who I admire are the most important to me.